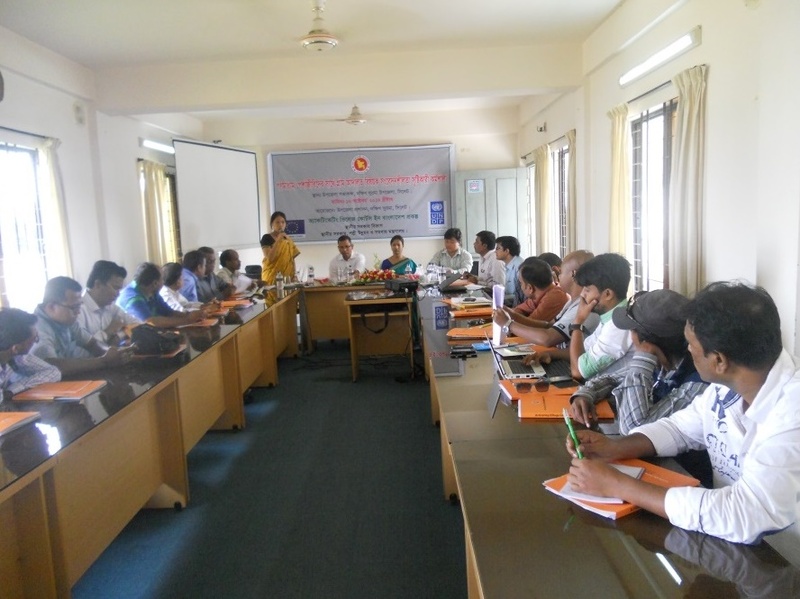 As part of its continuous endeavor to sensitize and involve key stakeholders in activating village courts, the Village Courts Project organized two upazila level sensitization workshops at the Upazila Parishad Conference Room of Dakshin Surma and Bhandaria Upazila respectively in Sylhet and Pirojpur District on 16 October 2014. The project arranged these workshops aiming to make the local media (print and electronic) acquainted with the project's endeavors to activate the village courts. Mr. AKM Shamimul Haque Siddiqee, Deputy Commissioner, Pirujpur inaugurated the workshop at Bhandaria Upazila while Mr. Atiqul Islam Uzzal, Chairman, Bhandaria Upazila and Ms. Asma Akter Vice-Chairman, Bhandaria Upazila were the special Guests. Mr. Kazi Mahbubur Rashid, UNO, Bhandaria Upazila presided over the inaugural session. In Dakshin Surma Dr. Subash Chandra Biswas, Deputy Director – Local government attended as Chief Guest and Ms. Srabosti Roy, UNO, Dakshin Surma presided over the inaugural session. In both workshops media professionals were given orientation on Village Court Act and the process of village courts. They were also informed on project achievements and role of different stakeholders including media with regard to the project. Training Officer, AVCB project Mr. Anamul Haque and Program Support Officers Uzzal Bhattacharjee and Sontosh Bikash Tripura facilitated the key technical sessions. Discussions took place underscoring effective role of media in advancing VCs at the union level in both workshops. In total 40 media professionals (18 in Bhandaria & 22 in Dakshin Surma) representing both national and local media participated in the workshops.